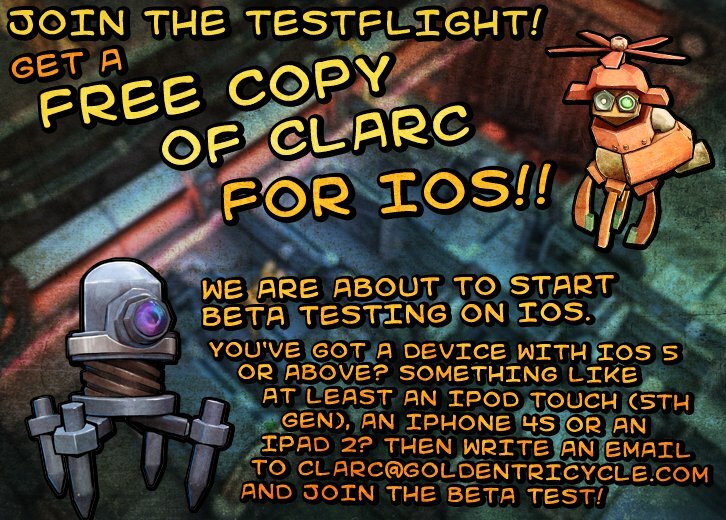 iOS Beta Testing about to begin! Join us in our quest to eliminate every single bug! As a thank you, you’ll get access to the full version of CLARC 1.0 once it’s ready to be released! If you want to join and you own a device that’s at least an iPhone 4S, iPad 2 or a 5th generation iPod touch, just send an email to clarc@goldentricycle.com or use the contact form. Hey I have a 4s. I would love to beta test your game! Hey Andy! Please write a message via the contact form! Thanks a bunch! I love puzzle games and would be interested in helping you test yours!